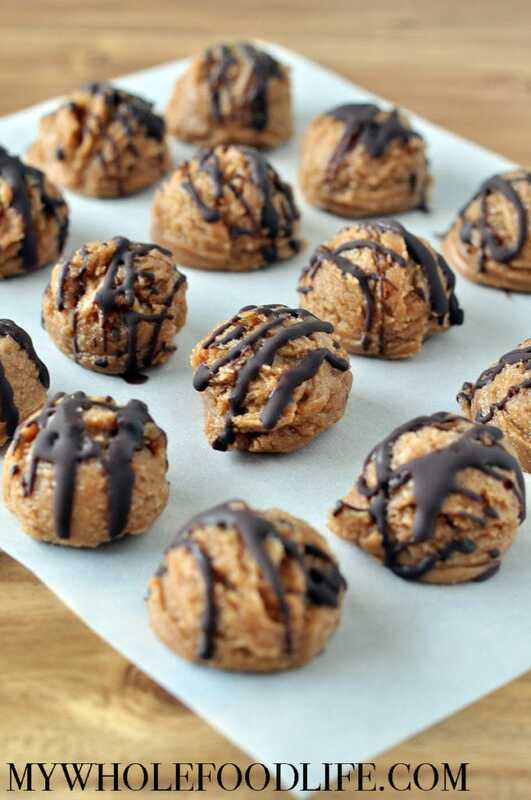 Put these No Bake Snickerdoodle Truffles on your must make list! When I was shopping at Whole Foods the other day, they were giving out samples of these vegan snickerdoodle truffles. While they were very delicious, the ingredients were definitely not the healthiest. So when I got home, I set out to make my own version and I think they came out pretty good. If you love truffles, you must also check out these dark chocolate raspberry truffles, and these pecan caramel truffles. This healthier truffle recipe contains only 6 simple ingredients and requires no baking! It’s also vegan, gluten free and paleo approved. I plan on taking them to my neighborhood wine party this weekend and I hope they will be a hit. A healthier truffle recipe you will love! In a food processor , combine the cashew butter, almond flour, maple syrup and cinnamon. Blend until smooth. If the mixture is firm enough, use a small cookie scoop to form into balls and drop onto a lined baking sheet . If the mixture seems a little too watery, stick the food processor bowl in the fridge for 10 minutes before forming cookies. To make the chocolate drizzle, melt the chocolate chips and coconut oil in a double boiler. Use a spoon to drizzle the chocolate over each truffle and place in the fridge for 15 minutes for the chocolate to firm. These should be stored in the fridge or freezer. Enjoy! How many truffles does the recipe make?! They look amazing! Thank you! Thanks!! I used a small cookie scoop and got 22.